You can use gluten-free bread crumbs for the topping or a mix of 1/3 cup salted sunflower seeds and a tablespoon nutritional yeast pulsed together in the food processor until crumbly. The pasta water included in the sauce adds starchiness that helps thicken it up in lieu of the traditional flour. I like to go all out comfort food and serve this mac n’ cheese with roasted broccoli with a squeeze of lemon and some red pepper flakes. Maybe add some mashed ‘taters to go all out Boston Market circa 1992. Served alone or accompanied by a side dish of your choice, you can’t go wrong! Preheat the oven to 400 F. Pour boiling water over the cashews and let soak for up to 30 minutes. Toss the peeled and cubed butternut squash with oil and salt and pepper to taste; cook for 15-20 minutes or until tender and golden. Bring a large pot of salted water to a boil. Cook the noodles according to the instructions, reserving a generous cup of the pasta water. Meanwhile saute the onion on medium heat with a tablespoon or two of “butter” until translucent and soft; about 5-7 minutes. Rinse and drain the soaked cashews. 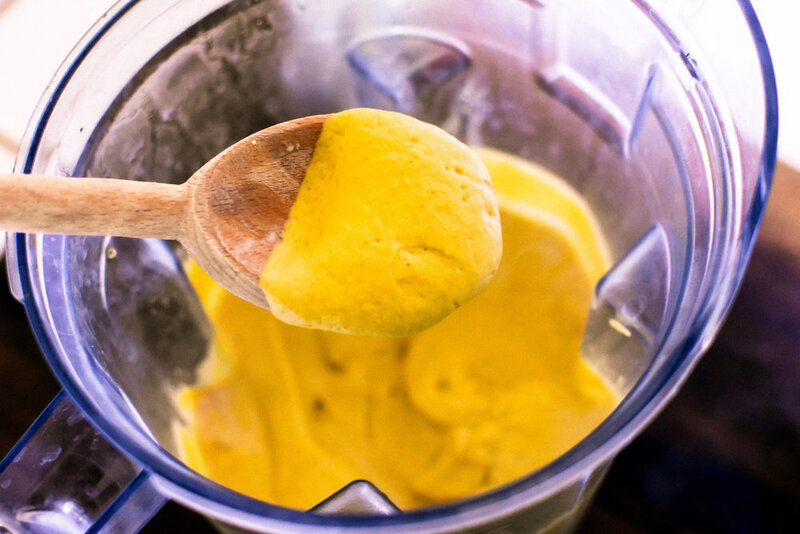 In a high speed blender, combine the butternut squash, onions, cashews, dijon mustard, 1/2 cup Myokos butter, turmeric, nutritional yeast, pepper to taste and 1 cup of the pasta water; blend until the sauce is smooth and creamy. Taste and adjust seasonings to your liking. Pour the sauce into the pot and stir in the noodles. Transfer everything to a baking dish or cast iron skillet. Top with bread crumbs of choice and broil for a few minutes until the top is lightly browed and crispy. Serve with red pepper flakes and perhaps some roasted broccoli with a squeeze of lemon. *Be careful of adding too much additional salt as the pasta water adds quite a bit of salt when mixed with the sauce.